A few years back, Ohio Governor John Kasich signed into Ohio law a ban on exotic animal ownership. The law has cost Taxpayers millions tat would be better spent of helping PEOPLE residing in the state of Ohio. And it’s not just Ohio Taxpayers but what goes on in Ohio costs all Taxpayers throughout the United States. Besides the money spent to create but includes and not limited to the creation of the law itself, an agency known as the ODA, an exotic animal penitentiary, staffing for an agency (ODA) for regulation and the penitentiary (the animals that are confiscated or surrendered when people can not possibly comply with the new regulations although many hold a USDA permit, have for years and well within or exceeding the USDA regulations), sending sway teams in and guards during the illegal and inhumane treatment of animals…The list goes on and beyond anything you would expect; ridding the state of exotic animals (Personal Property) is rather extensive…The enforcement team is nothing short of a group of Nazi like state employees who have over-step the limits of the law that were set in place to keep US citizens from theft of personal property. 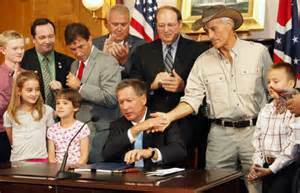 Signing the Exotic Animal Ban-Governor Kasich being congratulated by Jack Hanna who supported the ban. Governor Kasich is well aware of these FACTS yet he’s done nothing to stop the illegal enforcement by the ODA. Amy property seized in Ohio is to remain in Ohio especially when there are laws in place to protect to protect the property-Property rights are a Civil Liberty as all IS citizens are guaranteed their right to life, liberty and property as established by the creation of the constitution and it’s amendments. Animals are of no interest to the government beyond a public safety issue and this law does not address the actual reason they claim as reason for the laws creation which was based on a lie. The day will come when the actual truth is exposed as to what happened the night Terry Thompson died-Remember, the FBI did NOT investigate the matter but instead was instead by the local sheriff over a situation where the evidence, simply put, just doesn’t add up. There is still a reward out there for information concerning the Thompson’s death and one day someone will step forward to provide that information and to collect that reward. This is a meltdown of humane treatment of animals by the state and the unlawful treatment of Ohio citizens with an illegal and unconstitutional law…That truth already exposed and thousands of US citizens are appalled. 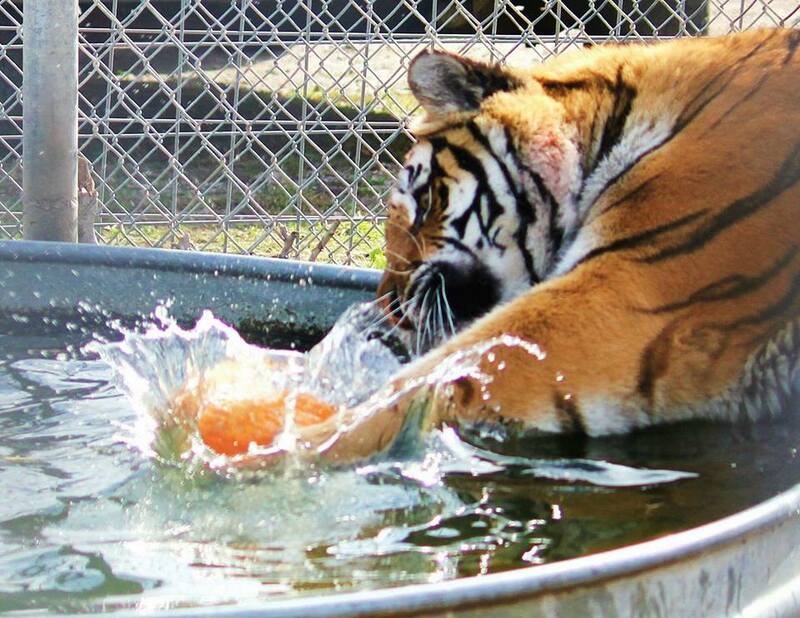 Leo died at the Ohio Exotic Animal Penitentiary due to poor animal husbandry skills of the ODA. The facility does NOT provide for the basic needs of any animal thus less large habitats, air or sunlight. This facility can be and has been compared to the Auschwitz Concentration Camp* used by Hitler during World War II. I am saddened to learn another animal has died away from her owners and a death that could have been possibly prevented had proper vet care been provided. A death that could have been prevented because ripping animals from their actual owners and caregivers most certainly would have notice their was a health issue rather that being moved numerous times adding additional stress imposed on animals caught in a system of bad wrongful laws. “Then the devil spawn ODA struck again. I really think they are trying to push us over the edge, well I got news for them.. I jumped off that cliff a long time ago, and climbed back up. Twice. So keep pushing, me and my army …are pushing right back at you. You may enjoy the power trip your on now but your decisions and actions will be judged not only by a court of law and your peers but by God. You will have to justify your sins against a man and community that just loved and wanted to care for HIS animals. how any of them sleep at night is beyond me. One of the tigers seized by state agents in early 2015 from a Wood County man was killed at a Colorado sanctuary Sunday, according to a statement released this afternoon by the Ohio Department of Agriculture. Veterinarians had diagnosed the tiger known as Shere Khan with malignant melanoma after a biopsy of a mass in her mouth. 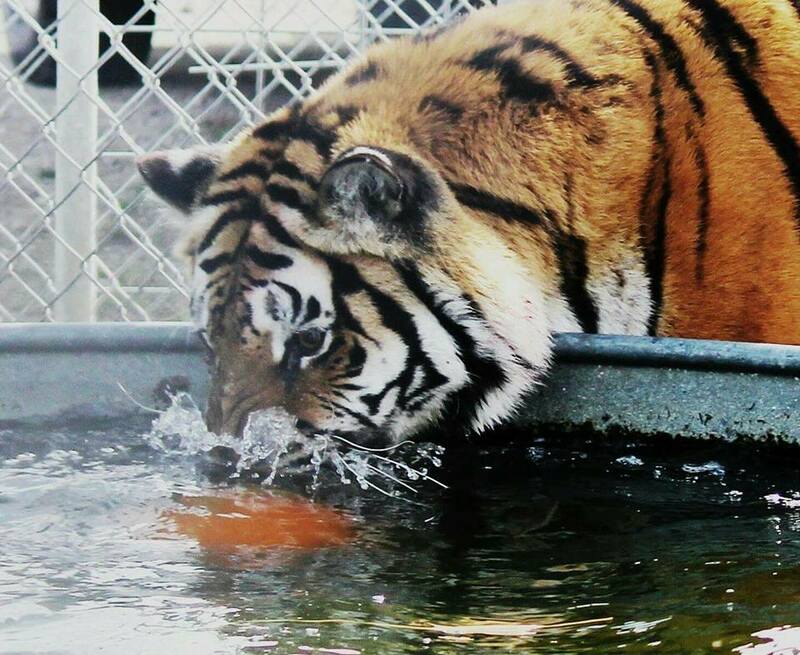 Corrina Hetrick Dankert, daughter of owner Kenny Hetrick of Tiger Ridge Exotics in Stony Ridge, said the female tiger should have been at home in her final days. “She should never have had to have died in a place she didn’t know,” Mrs. Dankert said, noting she blames the department and not the Colorado sanctuary that was caring for the animal recently. Shere Khan was one of three tigers and a Kodiak brown bear that in October had been removed from Spirit of the Hills sanctuary in South Dakota after an inspection by the U.S. Department of Agriculture revealed serious problems, including the poor conditions of Shere Khan and Kody, the bear. The other remaining animals are in sanctuaries in Arizona and Florida. A necropsy is to be completed at Colorado State University. “There is no amount of animal husbandry or medical care that could have prevented this diagnosis or prolonged the animal’s life in a humane way,” Mr. Bruce said. 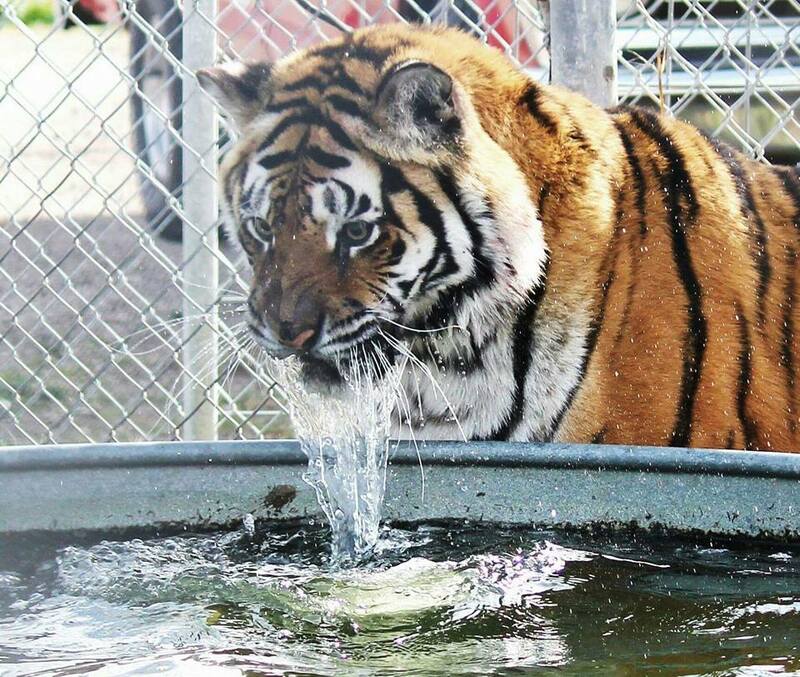 The Hetrick family has been embroiled in a number of legal battles after the ODA seized 11 large exotic animals from the Tiger Ridge property in January, 2015, because Mr. Hetrick did not obtain a permit as required by state law. 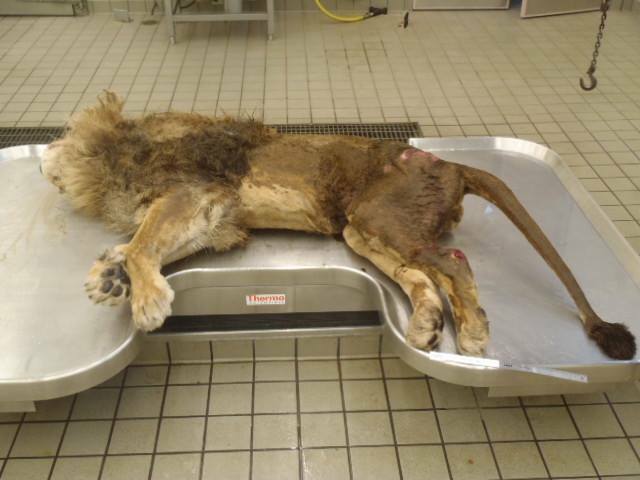 An elderly lion in failing health known as Leo was killed at the ODA’s holding facility in Reynoldsburg, Ohio, in April, 2015. A Wood County judge in November ruled on two cases regarding Mr. Hetrick’s permit applications, ordering the animals returned and permit applications granted, but the orders were stayed pending the state’s appeal in the 6th District Court of Appeals. Another appeal regarding the state’s original transfer order for the animals is pending in Franklin County, as is a third action in the Wood County court regarding the 2015 search warrant. The kicker-Did Shere Con actually receive the most up-to-date care in the treatment of a malignant tumor? Thanks to research done by my dear friend-it is questionable that the vets in CO at TWAS considered what the best treatment would be and certainly wouldn’t have been to put her to sleep as the first option!!! A 13-yr-old intact male African lion (Panthera leo) presented with a 4-mo history of left maxillary lip swelling. On physical examination, a 10-cm-diameter, ulcerated, round, firm, and pigmented mass at the level of the left maxillary canine tooth was noticed. All other organ systems examined were within normal limits. Multiple biopsies of the mass were collected and fixed in 10% neutral buffered formalin. Histopathologic evaluation of the biopsies revealed a malignant dermal melanoma. Hematologic and plasma biochemical parameters were within normal reference ranges. Thoracic radiographs taken 3 days following initial presentation showed no evidence of metastasis of the tumor. Computed tomography of the skull and neck was performed to evaluate local tumor invasion and to plan for hypofractionated radiation therapy. Therapy included four weekly treatments of 8 gray external-beam hypofractionated radiation and four bimonthly immunotherapy treatments. Following this treatment regime, the tumor size was reduced by 50%, and surgical excision was performed. No major side effects associated with radiation or immunotherapy were seen. Six months after diagnosis, hematologic and plasma biochemical parameters were within normal limits, thoracic radiographs showed no evidence of metastasis, and the lion showed no clinical signs of disease. The lion will continue to receive immunotherapy every 6 mo for the rest of its life. To the authors’ knowledge, this is the first report of a successful treatment of a malignant dermal melanoma with external-beam hypofractionated radiation, immunotherapy, and surgical excision in an African lion. Apparently Pat Craig’s vets are not up-to-date yet that article was written in 2013!!! I contend that Shere Con did not have to die because only an actual owner would have done all the research to make proper treatment possible. Pat Craig is not the actual owner of those animals and likely a low priority on his list. TWAS should be held responsible for this senseless death where no attempt was made to continue her life. Neither Dead or Alive, Shere Con’s remains will not be returned to Tiger Ridge…Her owner Kenny Hetrick will not be seeing Shere Con again. Note: Carole Baskin collects the skins and even bones of her animals and on display in the BCR Party Room and trophy hunters collect the remains of the animals they kill; both prime examples that indicate the value of these animals after their death. Whether Kenny Hetrick would collect some of the remains before laying her to rest will remain unknown. It is a FACT that he and his family are suffering and grieving over the losses that the Governor of Ohio is responsible for once he signed that bill to become [BAD] law. Anyone who has lost a pet knows what this family is feeling right now. Governor Kasich should be held libel for the senseless deaths of the Tiger Ridge animals even if the court case is lost. The Hetrick family remains the legal longstanding owners of their animals. YOU the Taxpayer should be alarmed no matter where you live in the United States as YOUR tax money is paying for the abuse of US citizens and their animals (Valuable property). Video can be found on The Wild Animal Sanctuary FB page, November 16, 2016…He did not have permission from the animals actual owner to use their animals in the making of a video to collect donations-It’s legally libel and The Hetricks should pursue a lawsuit for the use of their animals in the making of “Anatomy of Rescue” published 11/16/2016 as a promotion to collect donations which in this case would be FRAUD as he was paid by taxpayers…Remember, this the guy who threatened to kill all his animals if he didn’t receive donations-Just how was it responsible for the ODA to place those animals in the care of a crazy person?!? Over 17,000 likes…Over a 1.6 million views…No telling how much money was collected as donations with this heart-wrenching professional video similar to others put out and promoted by others and was made intentionally to gather finds for TWAS; however, that money should go to Hetricks because this video was made for the collecting of funds based on a lie-TWAS was paid for transport and is being paid to provide for those animals!!! No permission or contract was ever made with the Hetricks family who are the actual owners of the animals by law NOT the ODA!!! ~ by topcatsroar on December 17, 2016.